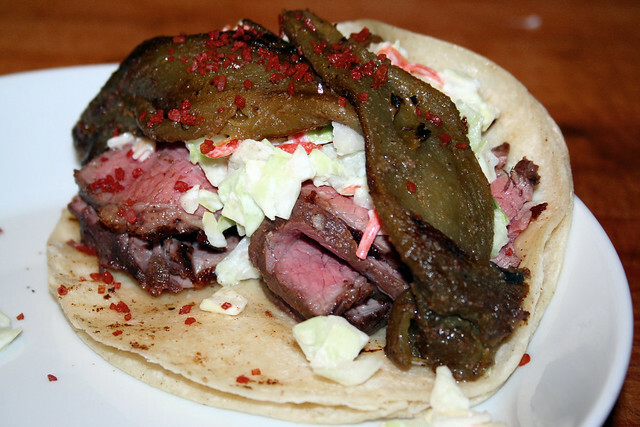 The Rogue Gourmet :: Carne Asada Tacos Cooked Sous Vide Part 2. 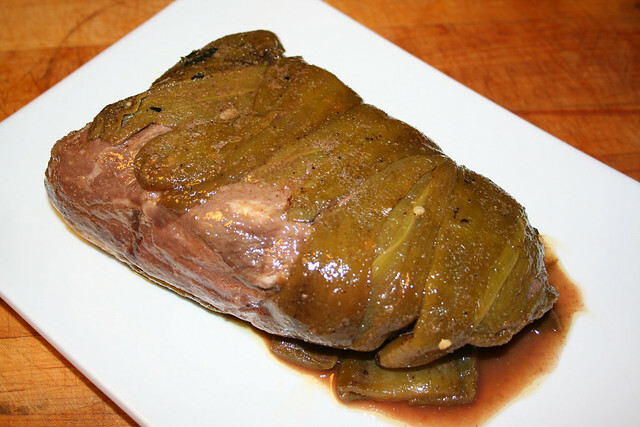 In both recipes, I wrapped the tri-tip in green chiles - 2 small cans, and included the juice from one can in the mix I added to the vacuum bag I cooked the meat in. 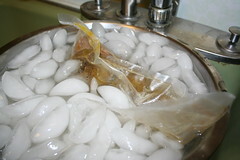 After cooking the carne asada in the SousVide Supreme for about 4 hours at 140 degrees F. / 60 degrees C. I dropped the bags into an ice bath to cool them rapidly, and then put them in the fridge overnight. The next day I removed them from the bags (reserving the liquid, and green chiles) and let the roasts come to room temperature, and dry off completely, before putting them under the broiler for about 4 minutes per side - browning the roast while letting the interior only warm. 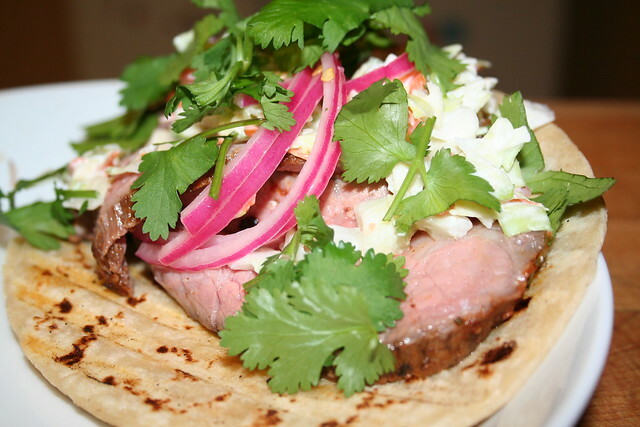 The result was a nicely browned meat that was a perfect medium rare (which is how I love it).The resulting tacos, where wonderful, full of flavor from the marinade, incredibly tender and perfectly cooked. I seved the tacos with slaw, cilantro, pickled onion, and the green chiles (which I roasted quickly while the meat rested). 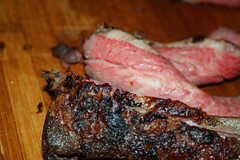 The Meat was sliced very thin, and topped with a drizzle of the reserved cooking liquid. 1. Pack tri-tip roast in appropriately sized vacuum bag. 2. 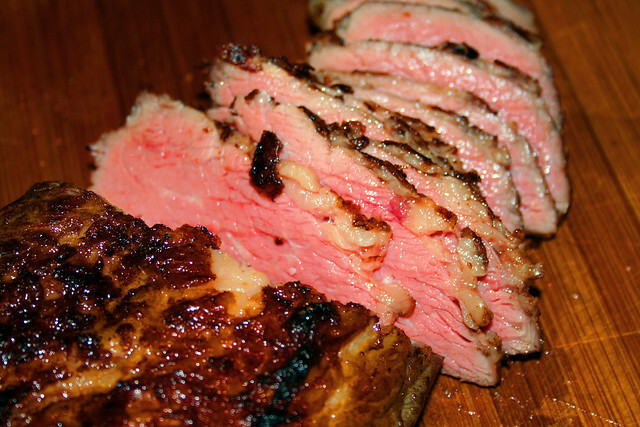 Surround tri-tip with chopped cilantro and green chiles. 4. 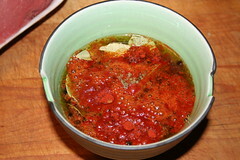 After thoroughly mixing marinade, pour marinade into bag and seal with vacuum bagger. 5. 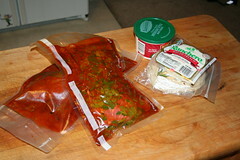 Place bag in the refridgerator over night to marinate. Place the marinated roast (in the vacuum bag) in the SousVide Supreme (or other sous vide machine) at 135 degrees f. / 57 degrees c. Make sure that the roast is fully submerged. Cook the roast for at least 4 hours (up to 8 hours is actually better). When throughly chilled move roast to the refrigerator and continue to marinate overnight. 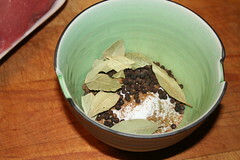 Remove Roast from bag, reserving liquid, and green chiles. 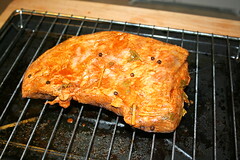 Place roast on a wire rack or broiling rack (as seen in photo below) and dry thoroughly. 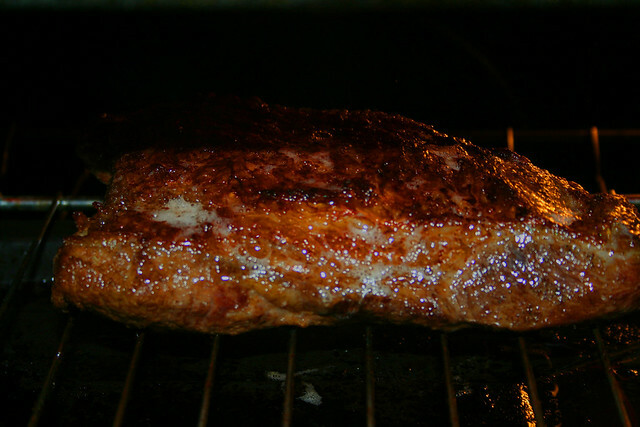 Place roast under a high heat broil (or grill) for 3 to 4 minutes and turn for an additional 3 or 4 minutes let surface brown well (high heat must be used so that interior of the meat does not overcook). 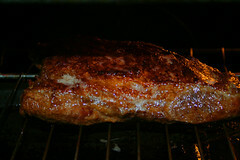 Let the finished roast rest for at least 10 minutes, and slice the roast into thin cuts. Drizzle reserved liquid over sliced meat, and serve with your choice of sides.